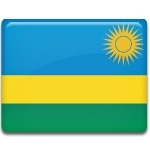 National Heroes' Day is one of Rwanda's public holidays. It is observed annually on February 1. On this day, people who gave their lives for their country are remembered. Rwandan national heroes include major general Fred Gisa Rwigyema, King Mutara Rudahigwa, Charles Rudahigwa, Michel Rwagasana, students of Nyange Secondary School, Felicite Niyitegeka, Agathe Uwiringiyimana. Most of them were murdered during the Rwandan Genocide. The list of national heroes also includes the Unknown Soldier who represents all known and unknown combatants who perished in the struggle for the liberation of the country from the Hutu regime. The National Heroes' commission is constantly working on identifying more persons who are worthy of the honorable title because they gave up their lives for the tranquility in their country. Countrywide celebrations of National Heroes' Day start early in the morning. A wreath-laying ceremony is held at the Heroes Mausoleum in Kigali City. It is attended by the president, government officials and family members of the national heroes. Other victims of the genocide are mourned on April 7, Genocide Memorial Day. The week following April 7 is an official week of mourning in Rwanda.